In 2009, four quarterly meetings were conducted with 56 CDC and community members, one capacity building training were conducted for improving communication skill with 15 of CDC members. One exchange visit with 20 CDC members was also implemented and one CDC organized a community project to install 532 meters of new drainage/sewer pipes. Over the year, CSARO had organized five quarterly meeting with 136 members of Waste Pickers SHGs, conducted five training workshops with 60 SHG members, conducted one training on recycling trainer with 10 members of waste pickers SHGs, conducted three exchange visit with 59 member of waste pickers SHGs, and conducted five recycling trainings with 44 members of waste pickers SHGs. The Community Development Committee in Samaky community became more proactive in taking control of local development works. They increased their ability to identify needs based and rights Based, assist conduct meetings and help in training villagers and self-help groups. The Community Development Committee in Sen Sok 4 was active in implementing community initiatives supported by CSARO such as Meeting, Training and sewer drainage construction. 20 participants from the Waste Picker recycling training practiced waste recycling skills well. 10 participants from the training of trainer course became good trainers for recycling courses. My name is Vong Saven. I am 45 years old. I am from Sen Sok community, Sangkat Khmuonh, Khan Sen Sok in Phnom Penh, Cambodia. I have three children (two girls and one boy) and my husband works as a motor taxi driver and we have very meager money to manage our family. I recycle magazine and other paper into home decoration items to contribute to family income. I am a member of Self-Help Groups (with seven other women) who recycle paper and other material into home decoration items. I have received training and marketing support from CSARO for recycling different items into beautiful things. I sell my output to vendors at the Toul Tom Poung market. My work has not just brought in money, but also increased my confidence, self-esteem, and my courage to face the future. My income is supporting my family expenses and now all my children can go to school, and we have purchased a motorcycle. 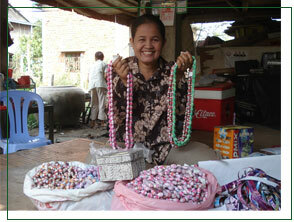 I am respected by my husband and neighbors because I earn for my family income. My dream is to earn more and expand my business.